Finding the right new door is just part of your process. Next you must consider who to have install it. If you are considering installing it yourself or considering hiring an inexpert handyperson to install it, then we hope you will read on to find out the problems that could cause. Then contact Charles Window and we can come provide you with a free, no-obligation consultation. 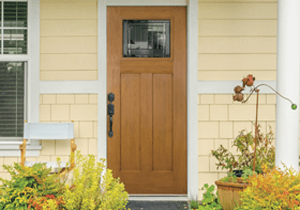 One of the biggest issues is that a door that is not installed well is simply unlikely to work as well as a door that was properly installed. For example, you may end up with a door that slams closed, that sticks when you try to open it, that isn’t entirely level, that swells with the weather changes, and other issues. These can actually become safety issues and they can certainly result in higher utility costs too. If you do not have your door installed correctly then it will not be water tight and this can be a huge issue. Doors are manufactured in order to withstand rain and water, but your interior flooring, walls, etc. are not. If water is allowed to seep through a door that is not sealed then you could be facing thousands of dollars in repairs. Yet another issue with a door that is not properly sealed is the issue that heating and cooling costs could be out of control. In fact, experts say that about one-fifth of heating and cooling loss is caused by doors or windows that have not been installed and / or insulated correctly. If you have gaps under or around your door then you can expect that your HVAC system is having to work harder to keep your home warm or cool. If a person wants a home to break into, they are going to look for the most vulnerable option on the block. If your door is visibly installed incorrectly then it could be at risk. But keep in mind that burglars aren’t the only ones to worry about – an incorrectly installed door also means that pests can be more likely to get into your home. If you want to avoid these potential issues, turn to the pros at Charles Window.